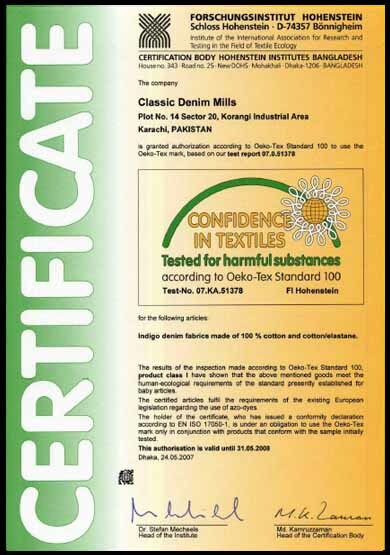 CLASSIC DENIM is a prestigious project, which was founded after undertaking deep market study of denim and denim products. Our goal is to serve the existing denim trends by innovation and creation of new trends/products to compliment the market. With our expertise and with state-of-art machinery, we are making major inroads in the international denim market. This can be attributed to the high quality standards observed and practiced by the company. Our products pass through processes like beaming, dyeing, sizing, weaving and finishing on sophisticated machinery, especially selected for these purposes from USA and Europe. The consultants and experts, who are involved, have been chosen from the best in the industry and are spearheading the revolution in the denim industry. Our vision is clear and futuristic and our sales is targeted to the export market. This is the most important and indispensable process. This machine from Italy has an inbuilt Rotal sizing system. It comprises of 17 boxes, 3 mercerizing, 10 dyeing and 4 washing boxes coupled with steam chamber to maintain dry and wet crocking in Sulphur topping and bottoming, Rotal sizing is done with double dip/double nip. In Indigo flow, both the machine and color kitchen is connected with stainless steel piping to provide stipulated water, steam and condensate at right quantity at right time. This is fully computerized machine, which allows process data collection and data feeding. It is characterized by the maximum operative flexibility and also work with each type or brand of sizing machine. The machine works with a capacity of 34 meters per minute. The plant equipped with Picanol air jet looms, is originated from Belgium, which gives finest weaving quality. It is an electronic driven machine with microprocessor, intelligently assists to get optimum output and good quality fabric. We can weave the fabric up to the width of 190 cm and can use yarn from NM4to NM170 and filament yarn from dtex22 to dtex1100. We have also Gamma rapier looms with electronic Dobby having four colors feeder. This most important process contributes final look and feeling of the Fabric. This machine is originated from Italy. In this process the shrinkage is adjusted. This machine works a capacity of 50 meters per minute. This is the last and important process where fabric are 100% inspected with ASQC system called ‘four’ point system for reducing rejection and wastage and increase the productivity at garmenting stage. We are using Metotex inspection machine for the inspection. The fabric is rolled on tubes as per the export and domestic practice. The utility machineries provides backup for the entire production process. CATERPILLAR 2.5 MW Generators from USA, Steam generator from BABCOCK and WELLCOX from England, Oil free screw compressor from Atlas Copco, Absorption Chillers from Air-conditioning Century of Korea. This Switzerland originated machine is to cater our need of PH balanced water, which is needed for processing in different stages of production. It has a capability of desalinating 100,000 Gallons per day. We are in completion process of WASTE WATER TREATMENT Plant as per norms set by World Bank (IBRD) and World environment bodies to meet International Standard.